A construction company does more than just builds homes, buildings, and other massive structures. They are also an organization that must demonstrate their professionalism to the client. This professionalism is achieved through their hard labor building structures to the paperwork that they handle in the construction office. A lot of the paperwork is connected with dealing out estimates or quotes to their clients. 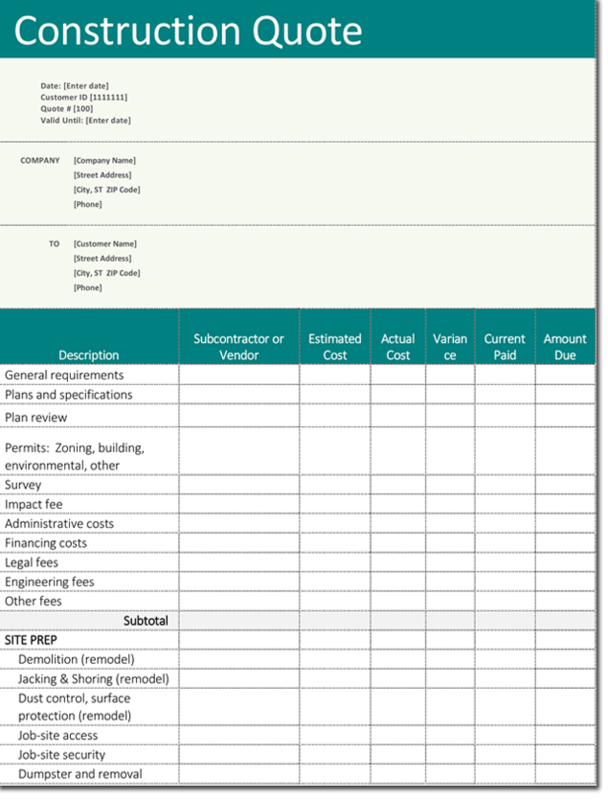 These are prepared documents that include the construction quote. Included here is a professionally designed construction quotation template specifically for that important purpose. The free quotation template that is provided here is easy to download right to your computer. The template is designed in Word and Excel, which are popular software programs that are on most computers. Consequently, they are easy to use and start customizing immediately without much of a learning curve. In addition, the templates are completely editable. You are able to delete or add additional information. It is also easy to add a company logo, company addresses, company telephone numbers, serial numbers, notes, and other important information. Anyone that is involved with a construction company realizes that the client will request as document to establish the presentation of a quote. Certainly, this is important for the customer’s records and the construction company’s records too. The service quote should be as detailed as possible. The quote is studied by the potential client and the client will generally based their decision to hire the construction company on the price quote that they received. Indeed, the construction quote is only the beginning. It should outline all the important details that concern the construction project in a precise, clear, and easy to understand format. Clearly, that is possible with the help of the professional quality templates that are included on this page. Download them today.